The meeting will be an open meeting of the United Front with the Brics Summit a major item for discussion. This discussion will focus on how we can engage our respective constituencies on key questions such as: What is BRICS doing to increase or reduce poverty, unemployment and inequality in Africa and the world? What is our attitude towards BRICS? The discussion will also explore what action, if any, should be taken to register our views on BRICS, its politics and its developmental programme. We are hoping to form a Coalition that can take forward these discussions and tasks. Please send your representatives to attend this meeting. Your attendance is crucial to the success of the meeting. Thank you. The 8th BRICS (Brazil, Russia, India, China and South Africa) Summit will be held in Goa, India from 15-16 October 2016. Set up in 2009, in the aftermath of the 2008 global financial crisis, with four countries and then expanded to South Africa in 2010, the emergence of the BRICS was seen in many circles as a concrete step towards constructing a multi-polar world. This was soon underlined with the setting up of the BRICS New Development Bank (NDB), the China-led Asia Infrastructure Investment Bank (AIIB) and the Contingent Reserve Arrangement (CRA) that were supposedly direct challenges to the hegemony of northern dominated institutions such as the World Bank, Asian Development Bank (ADB) and International Monetary Fund (IMF). However it was soon evident that these new initiatives, while allegedly eroding the dominance of the Bretton Woods Institutions, would in reality work in a complementary and collaborative fashion with the latter. For example, during a balance of payment crisis, the CRA forces a borrowing country to go to the IMF for a neoliberal structural adjustment programme after getting just 30% of its quota in CRA loans. BRICS’ Transnational corporations (TNCs) that extract valuable resources from the world’s poorest regions are reported to be just as brutal in accumulating capital as northern TNCs. The BRICS’ record at the World Trade Organisation (WTO), Free Trade Agreements (FTAs) and at the United Nations Climate negotiations has also been one of strategic accommodation with the global north. 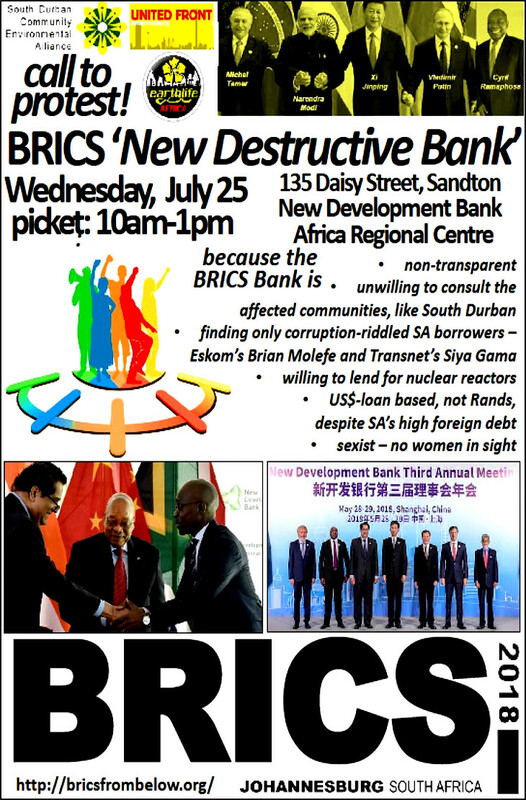 Given this continued adherence to a largely neo-liberal development model and an export-led growth trajectory based on cheap labour, rising inequality, financial speculation and multinational corporate exploitation, with little consideration for social and ecological costs, the expectation that the BRICS would usher in a systemic shift in the world economy was soon debunked. Nevertheless, the BRICS have, on occasion, taken progressive positions on geo-politics; in opposing unilateral military intervention in Syria and calling for a just solution to the question of Palestine. Russia and China have played a key role in containing NATO, albeit due to expansionary geopolitical tendencies of their own. India and Brazil kept alive hopes for inexpensive life-saving medicines by rejecting Intellectual Property monopoly, helping South African AIDS-treatment activists beat their own government ten years ago, leading to a 10-year improvement in life expectancy. At best, the BRICS is a contradictory forum posing immense challenges with some opportunities for critical engagement. The 2016 BRICS India Summit is being hosted by the NDA Government in the midst of multiple global and national crises. The world continues to struggle with the impacts of the 2008 global economic crisis and conflicts in West Asia and the Arab world show no signs of resolution. Despite the unravelling of 25 years of neo-liberal policies in India, the NDA Government continues to push privatisation of essential services, promote large scale infrastructure projects such as mega industrial corridors, nuclear parks and mega-ports and de-regulate labour, land and environmental laws in the interests of capital. Any resistance against this by students, labour unions, academics, writers and social movements is often crushed by the Government, labelling them as ‘anti-national’. In May, Brazil’s democratically elected President Dilma Rousseff was ousted through a constitutional coup, with no formal objection from her BRICS allies. The rightwing interim President Michel Temer is now actively pushing for the potential privatisation of all state companies, such as Petrobras, electricity utilities, ports and airports. We unequivocally condemn the coup and stand with Brazilian groups that are challenging the ouster of President Dilma. In South Africa, the adoption of neo-liberal policies by the ANC Government has led to tens of thousands of protests by labour unions and community groups. South Africa has one of the highest unemployment rates in the world (close to 40%), and an employment-income inequality Gini coefficient of 0.77, the world’s highest. While Russia occasionally adopts stances against Western imperialist projects such as NATO, President Putin has pushed an authoritarian capitalist model which has seen rising inequality, declining real wages of the working class and a consequent deterioration of living standards. Much has been written about China’s extraordinary success as a global power and its supposed challenge to western hegemony, but evidence is also mounting on how the growth of Chinese capitalism is resulting in dispossession and pauperisation of the disempowered and destruction of the environment, while facilitating immense wealth accumulation by the elite. It is critical that we situate the 2016 BRICS summit within this global, regional and national context. 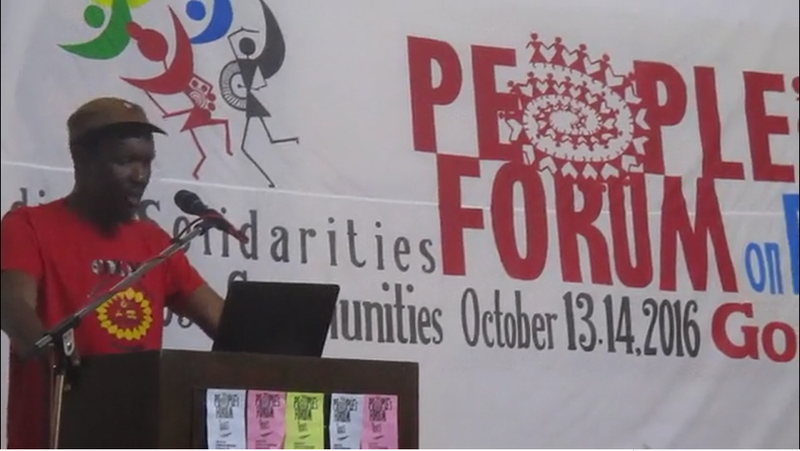 The idea behind the People’s Forum is to provide a space for progressive trade unions, social movements, academia and civil society from various BRICS countries to share analysis, struggle notes and build solidarity in the resistance against neo-liberalism and corporate globalisation. It will also be a space to put forward and discuss alternatives for a just and equitable world that are emerging out of people’s struggles. The People’s Forum will be held in Goa, on the western coast of India. Goa has been an active site of struggle against neo-liberalism with vibrant movements for labour rights, women’s empowerment and environmental justice. Groups from Goa, along with other Indian organisations will jointly host the event which will include plenaries, self-organised workshops, cultural events and films. We invite all likeminded groups from across India and BRICS countries to come, join us in Goa. Please get in touch with us if you are interested in organising a workshop. We look forward to welcoming you in October.